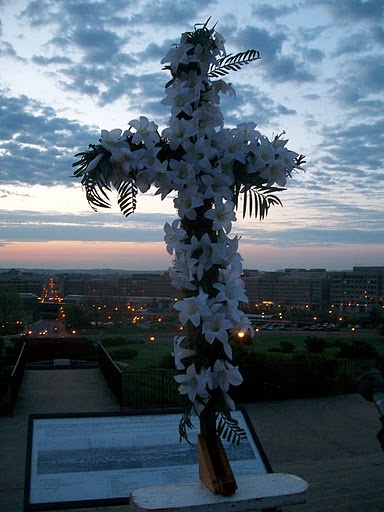 The 81st Annual Easter Sunrise Service, sponsored by the Grand Encampment of Knights Templar of the United States of America, will be held this morning on the steps of the George Washington Masonic Memorial, Alexandria, Virginia. The parade will form on the lane leading up the hill and will step off at 7:30AM. The Service will begin at 8:00AM, and will be conducted by Right Eminent Grand Prelate, Sir Knight William D. Hartman. 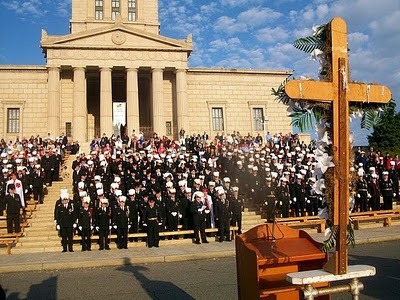 In Los Angeles, the West Coast Easter Observance will take place at 9:00AM at the Shrine Auditorium. Los Angeles Commandery No. 9 is the host Commandery, and the Knights will assemble and march in formation down the street from the USC Raddison Hotel to the Shrine Auditorium.